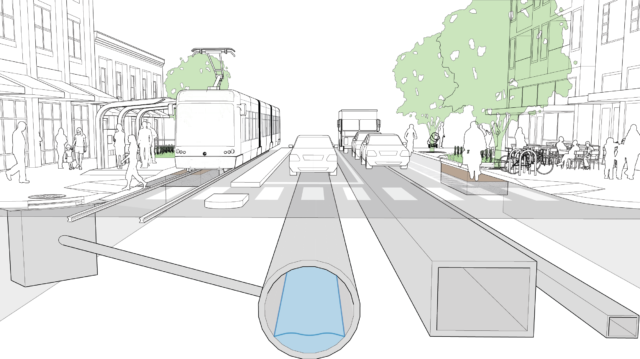 After identifying network-level goals and opportunities for stormwater, mobility, and land use, evaluate specific street contexts to guide project-level decisions. At each potential site, consider native soil quality, existing infrastructure, adjacent buildings and structures, slope, and citywide policy goals. Choose from a range of stormwater elements and techniques depending on the space available—from bioretention planters to stormwater trees. Use a combination of stormwater elements to meet overall project goals. Design tools and elements are further detailed in Ch. 4 Stormwater Elements. Native soil characteristics determine the types of facilities that are possible, as well as the required intensity of the design. Capitalize on high-quality soils for their infiltration capacity. 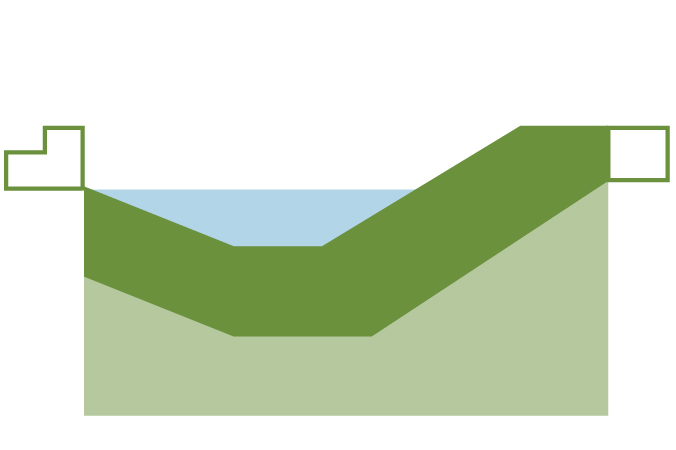 Analyze the soil’s infiltration rate. 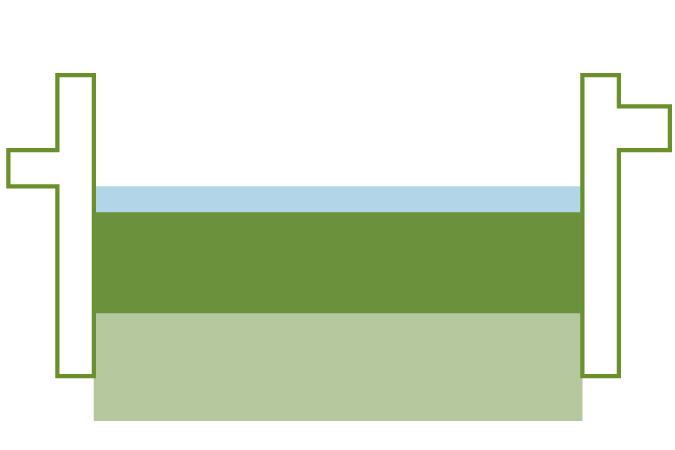 Gravelly and sandy soils infiltrate water more quickly than clay. 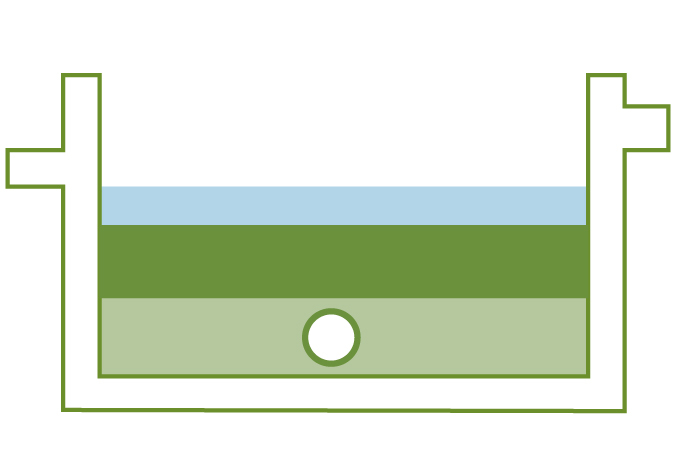 In areas with slow infiltration or poor soil quality, GSI can be designed with an underdrain. Test soil for contamination from previous projects, especially at industrial sites. Investigate the depth to the groundwater table. In areas with a shallow groundwater table or seasonal high water table, use non-infiltration stormwater facilities to prevent pollutants from reaching the water table. Consider the location of existing gray stormwater infrastructure, especially drainage grates and catch basins. Consider the location of subsurface transit infrastructure, utilities, and sleeves to avoid conflicts with stormwater projects. Take stock of adjacent buildings with basements or subsurface structures. Stormwater facilities may require liners or deeper walls to prevent lateral water seepage into basements. 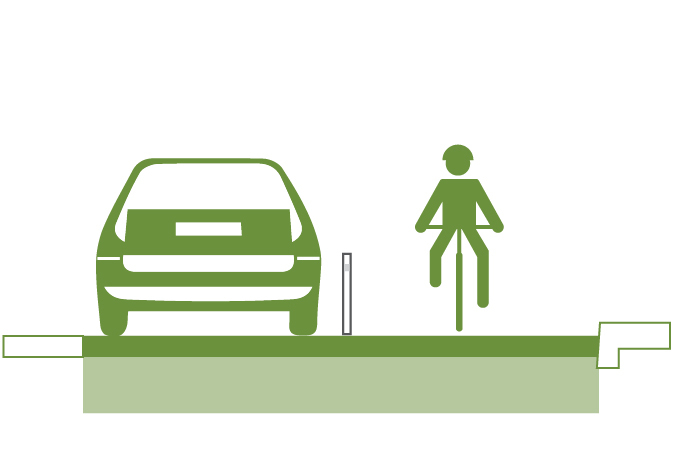 Consider other structures in the right-of-way such as transit stops, utility poles, mature trees, benches, wayfinding signs, or other street furniture. Maintain ADA access around doors and access routes. Identify opportunities for synergy, especially with adjacent redevelopment or property owners interested in beautification or flood mitigation. Streets with less than 5% slope are generally best for GSI projects, though innovative design strategies can make projects on steeper streets possible. On steeper streets, shorter cells with frequent berms can help to slow and temporarily store runoff before infiltrating. 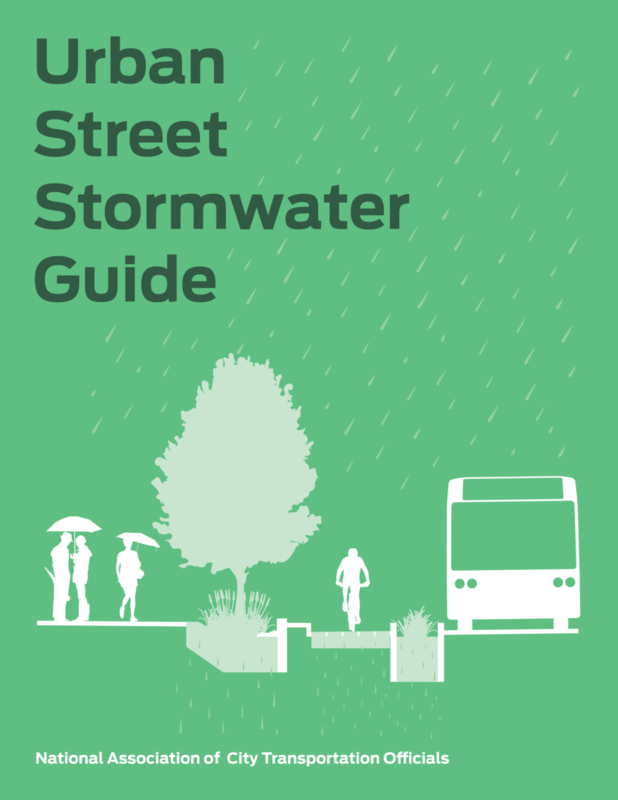 Consider the level of stormwater management that needs to be accomplished, as set by city policy, permitting requirements, or consent order. Some projects may only need a single bioretention cell, while others may need multiple cells on multiple street blocks to manage the desired runoff volume. If tree canopy and shade is a project goal, identify opportunities to include trees. A bioretention cell with vertical walled sides that detains and infiltrates stormwater into the soil below. A biofiltration cell has vertical sides, a closed bottom, and an underdrain. This cell treats runoff for quality before draining into a perforated pipe that directs flow back into the sewer. The soil and/or an orifice control device attenuate flow to reduce peak flows into the sewer. A bioretention swale has graded side slopes, allowing greater variety of plantings and infiltrating into the soil below. It can also be designed with an underdrain pipe and lined system if infiltration is not desirable. 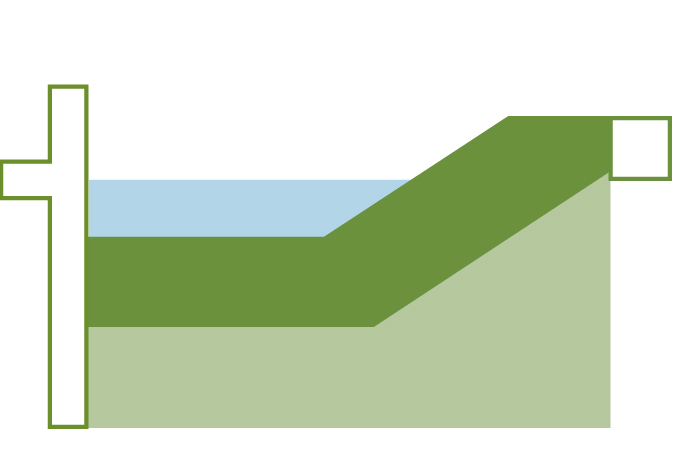 A hybrid cell has one side with a vertical wall, and one graded side slope, either draining into a perforated pipe or infiltrating into native soil. 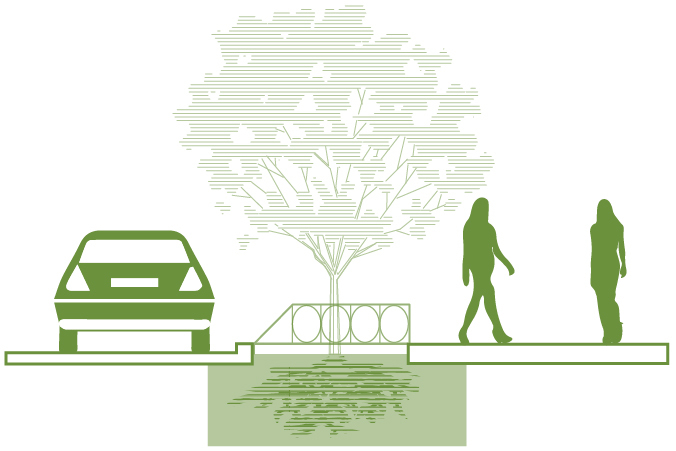 Trees for stormwater management can be planted in wells (walled cells housing a single street tree), tree trenches (linear cells with multiple spaced trees), or connected tree pits. Permeable pavement in the roadway infiltrates runoff directly underneath, and is comprised of permeable interlocking concrete pavers or porous asphalt or concrete. Permeable paving is suitable in contexts with lighter use.